JURIK is an Immortal Viking doctor who runs a crisis medical clinic in a developing country (I’m researching exactly where). Once upon a time he was a Viking with a mission to kill every dragon, a quest that cost the life of a woman who loved him. He rejected being a warrior, but his vow to save lives instead of taking them is regularly challenged by mercenaries and rebel militia who threaten civilians in his care. The Viking chief Ivar has summoned Jurik repeatedly over the last two months, but the only messages Jurik cares about are emergency calls. He hasn’t bothered to answer Ivar. LAURA appeared in First to Burn as a combat zone photographer. She’s also the granddaughter of Ivar’s Italian property manager and knows all about the Viking chieftain and his brother Wulf. 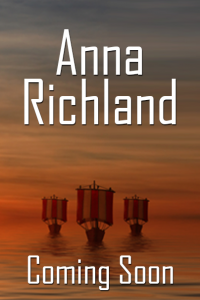 Her job provides the perfect cover to deliver a final demand from Ivar to the Viking doctor working deep in dangerous territory. She expects to be in and out in a few days, message delivered and news-worthy photos to show for her trip. The errand shouldn’t be too hard. She might even make it through her third week in a row without a cigarette. You don’t have to be fifteen centuries old to know neither quitting smoking nor corralling Vikings is ever easy. After snapping a photo of something she shouldn’t have seen at the airport, the only way Laura’s getting out alive is with Jurik’s help. Together they must evade rebel militia, government forces and shadowy soldiers with mysterious abilities. A thousand years ago, a woman who loved Jurik was killed by the last dragon, and he slew the fire-breathing wyrm in retaliation. History celebrated Jurik’s deed in the legend of St. George and the Dragon, but he blames himself for the extinction of the only species stronger than the Vikings. The last route their brethren had to find mortality was destroyed by his sword hand. Real dragons are gone, because of Jurik.